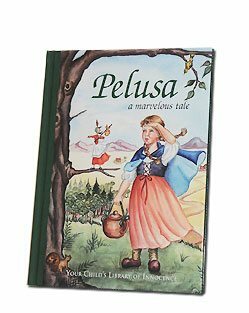 Renowned Spanish Jesuit, novelist and biographer, Father Luis Coloma, sets out to capture the imagination of the little people in his family in Pelusa. In a riveting story charged with a child-like drama where good triumphs over evil, Father Coloma spins a riveting fairy tale in a religious setting. Evil is represented in the person of an old woman named Cobwebs who kidnaps a baby girl peacefully sleeping in a palace garden, and brings her up to do all the cooking, cleaning and washing. “Grandmother,” asks the little girl tearfully one day, “why don’t I have a Papa and a Mamma, like all the other children?” The old woman informs her that she was found in a rabbit’s nest, hence her name, which is Spanish for the fur that rabbits use to build their nests. Pelusa is as good as “freshly baked bread,” works hard and never complains. One day she finds an old faded doll whom she names Angelina. She dresses her as best she can, making the inanimate toy the companion and confidante of her lonely life. One day as Pelusa sits with Angelina on the steps of the house while Cobwebs goes to mail a letter in town she sees a beautiful family approaching. Unbeknownst to her, Jesus, Mary and Joseph have come to pay her a visit. Noticing how tired and hungry they are, she receives them graciously and serves them some soup that was boiling on the wooden stove. Here the “magic” begins to work in Pelusa’s life, as Fr. Coloma introduces the “Protecting Prince” in the person of Saint Joseph, the fairy godmother in the person of Holy Mary and the “Magical Wand” in the tiny hand of baby Jesus. As soon as the Holy Child spots Angelina, He holds her in one hand, and with a “wave” of His blessed fingers not only restores her paint and fixes her broken leg, but brings her to life! Pelusa claps, Angelina dances and all is joyful. The Blessed Lady then informs wide-eyed Pelusa of the existence of her two beautiful parents and assures her that Angelina will lead her to them. This leads to exciting adventures with many obstacles, dangers and moral lessons. Tender yet powerful, the masterful pen of Fr. Coloma manages to convey to a young child the complete idea of the Christian journey on earth and what it takes to get to our final destination, Heaven. Translated and adapted from Spanish to English for the American public and colorfully illustrated on every page by Andrea F. Phillips, this book is part of America Needs Fatima’s Library of Innocence series. Click here to obtain your copy. This entry was posted in TFP Recommends Books and tagged fairy, Jesuit, Luis Coloma, Pelusa, religious, tale by Antonio Fragelli. Bookmark the permalink.